I am excited to write this post. I had won a wonderful cheese give away from Pam at For The Love Of Cooking. One of the cheeses that came with this give away was a nice package of goat cheese. Since I had never cooked with goat cheese before I thought it would be fun to try a pizza using this cheese. We have a pizza joint in our town that makes the best thin cracker crust pizza. My family loves the crust at this pizza place and I have been wanting to try my hand at making one of these crusts. 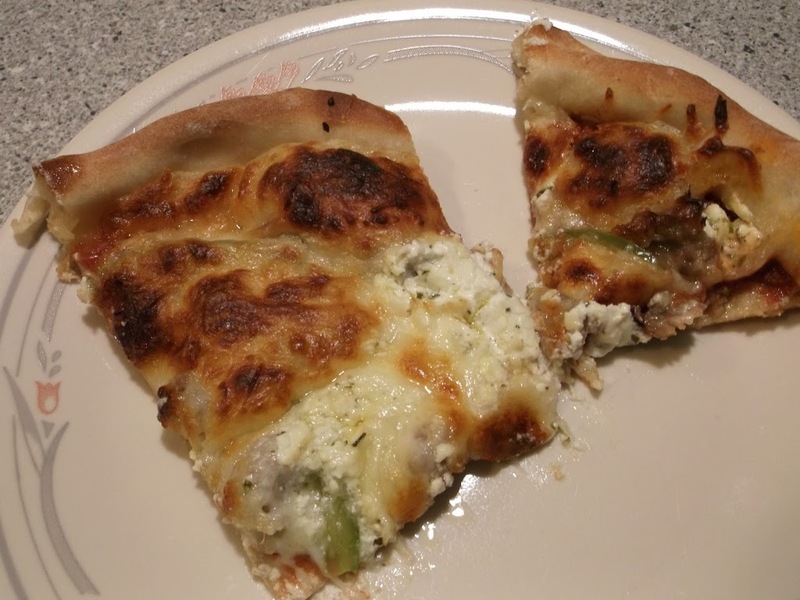 I decided I would try to make this one a thin crust pizza that wasn’t too much bread, one that we would get the full flavor of the goat cheese. Along with the goat cheese I decided to add some Italian sausage, a little onion and green peppers oh, and also I roasted a few cloves of garlic for the occasion. Roasting the garlic was a new experience for me, I have never done this in the past. I thought roasted garlic would be something that would pair with the goat cheese quite nicely. 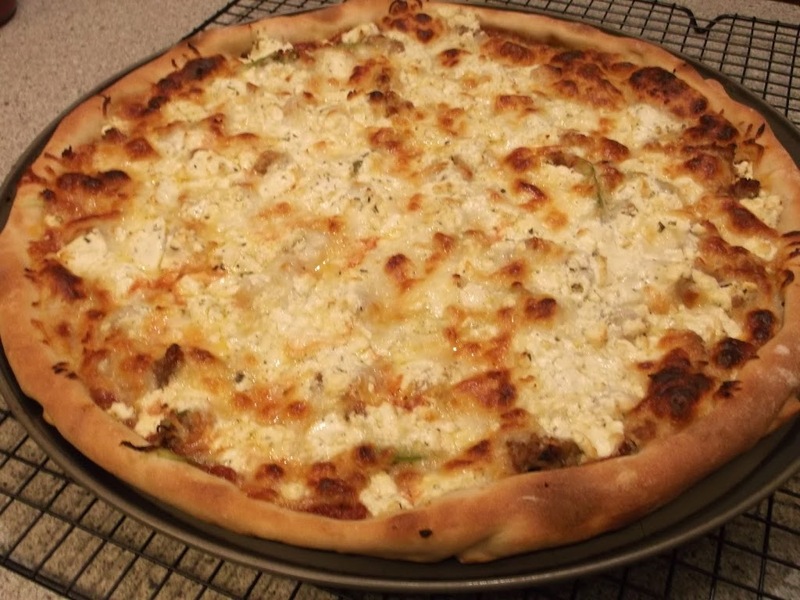 As the pizza baked in the oven the smell filled the house with smells of cheese and garlic. I think that we were all drooling with the anticipation of trying this pizza. Shortly after the pizza came out of the oven we cut the pizza on and dug in. What a treat this was. 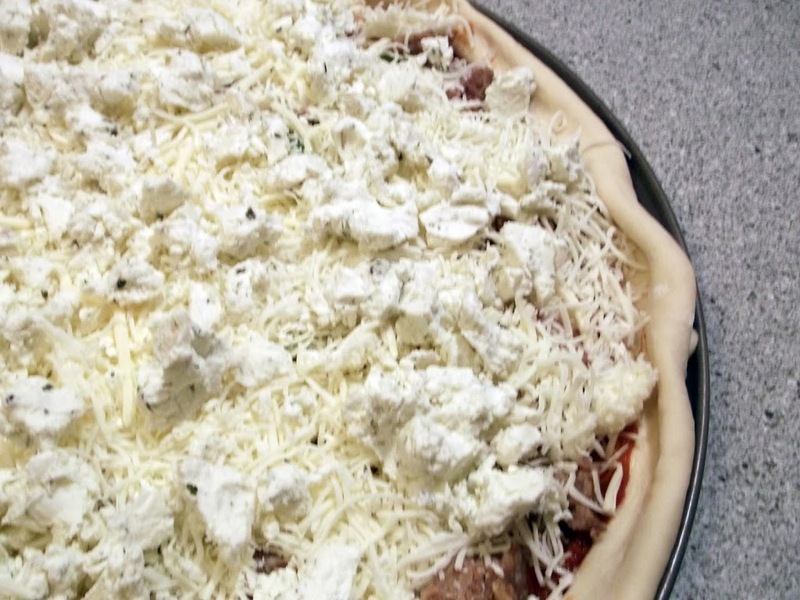 The goat cheese gave the pizza a wonderful flavor and we all enjoyed the pizza. The thin crust was good, but not quite as good as the pizza joint in town so I will need to keep working on that. But over all the pizza got a two thumbs up. Thanks again Pam for the wonderful give away. We are enjoying the cheese! Thinly sliced onions and green peppers (according to taste). Mix together 2 cups flour, yeast, sugar, and salt. To the dry ingredients add the warm water and olive oil. Mix together with spoon, until all ingredients are mixed well. Start to knead the rest of the flour into the mixture. Add as much of the flour as you can work in. When dough is completed coat the bottom of bowl with olive oil about a teaspoon. Turn dough to coat both sides. Cover bowl with plastic wrap and refrigerate for 24 hours. When preparing the dough for the pan, flour your surface lightly. Roll this dough until it is about paper thin. Makes about a 16 inch pizza or 2 smaller one. Top with favorite ingredients and bake in a 450 degree preheated oven for about 12 to 14 minutes. It looks tasty! I love the combination of ingredients you used. I am so glad your cheese FINALLY came. Nothing is better than a good homemade pizza! Yours looks fabulous! Congrats to you with the cheese! Your pizza looks fantastic!!! I’ve never had it with goat cheese and will try it soon. Now I’m drooling just thinking about it. Thanks for the recipe!